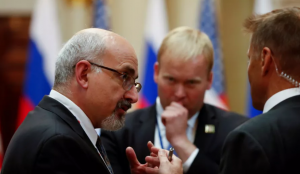 In an article published this afternoon by The Nation magazine — “I Came as a Journalist to Ask Important Questions” — Sam Husseini sheds new light on what occurred at the Helsinki summit yesterday when he was forcibly ejected from the Trump-Putin news conference. Husseini’s piece explains the significance of the small sign he was holding — “Nuclear Weapon Ban Treaty” — when accosted and ejected by police. And he lists some key questions that were left unasked at the news conference.